We may conclude a particular person to be of unusual capability or intelligence. But another society, a different set of standards, a different way of seeing things, may judge him to be merely in the median, meriting no special status. Which understanding is most approximate to the truth? For those living in a certain society, particularly in an island culture, that is the world; seeing through a private lens, a particular way of looking, with a distinct manner of understanding. Everything around them, their leaders, their professions, their workers, being the only image of the role they may relate to; are both perfect and imperfect. While despairing the imperfections that affect their everyday lives, they are but compelled to acknowledge the scheme’s perfection, for it is their mirror image, the whole, they see. Any change or substitute can only continue the same perfection and in deed the imperfection. I met Mr. Gunasekera while taking an afternoon stroll down Marine Drive, Colombo’s showpiece road by the Indian Ocean. He had worked many years in the United Arab Emirates (UAE), Abu Dhabi to be precise. Having earned well in today’s Eldorado, especially in our perception, Gunasekera had returned home to a comfortable retirement. A banker by training, he had held a senior position at a European bank in Abu Dhabi. I think his main function was risk assessment of borrowers. This gave him opportunity to form a reasonable overview of the country and the economic and social forces that drove it. The opinions formed during his long years there and his assessments of the forces shaping the country are interesting and may be of relevance in attempting to understand the realities of our own country. For purpose of economy I have edited and condensed what I gathered in the course of several conversations with Mr. Gunasekera. The United Arab Emirates (UAE) is a union of a number of small territories situated in the South East end of the Arabian Peninsula. The largest Emirate of the Union is Abu Dhabi which accounts for about 87% of UAE’s total landmass. Dubai is one of the smaller emirates of the Union. The Union itself is relatively small, being only slightly larger than Sri Lanka. What gives the United Arab Emirates its glamour status is the fact that lying under its soil is the seventh largest oil reserve in the world. Until oil came to the fore, this region was an under-populated (even today the native Emiratis only form about one-tenth of UAE’s total population), backward and by and large an ignored part of the world. Its primary importance for the competing imperial forces was geographical more than economical. The way to Asia, India and other valued imperial possessions lay through the Arabian waters. In the early times these seas were notorious for pirates and even slave trade. From about the late 19th century the British were the dominant force in the area, policing and protecting the fragile sheikhdoms while providing a certain degree of administrative and management cover. By the early 1970s, the former imperial power had no more stamina to carry on this role. The Emirates became independent in 1971. It was not a very hopeful beginning, with threatening disputes with the bordering countries, including Iran and Oman challenging its integrity. Things gradually settled down, but in economic terms it was barely notable until the oil boom of the mid Seventies and overnight the scenario changed drastically for the young country. 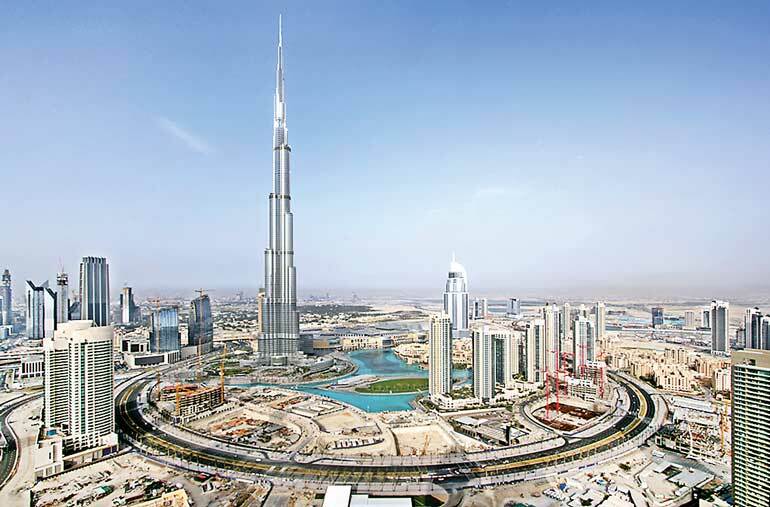 Now flushed with petro dollars, UAE began to transform itself in to an economic powerhouse. A country like Sri Lanka has a large labour force and fertile land but is poor in capital which has to be found by way of foreign investments or aid. For the United Arab Emirates, the equation was the opposite. They had almost unlimited capital, but very little of everything else. How they obtained the other necessary resources to achieve what UAE is today, is an impressive story of realism, courage and wisdom. When you look at the millions of immigrant workers in UAE, certain patterns emerge, which speak to the views and attitudes of the Emiratis as well as their grasp of the realities of the larger world. For example, the lifeblood of the country is in its oil and gas industry. This is now an extremely high technology industry and an activity in which the country cannot afford any risks. Here, the overwhelming numbers, especially in the high paying specialists, engineers and technicians category, are the American, Canadians, Australians and perhaps a few Russians. As we know these are the countries that have the most advanced oil and gas industries in the world. Where institution building, administrative skills, integrity of systems are required, it is the British the Emiratis have turned to. British expatriates predominate in the administration, universities, schools, hospitals, banks, stock market and similar financial institutions. Modern societies, especially if they aspire to a hub status, need the best available services and technology. In Sri Lanka, even a very basic service like electricity cannot be taken for granted, breaking down regularly and even when available, prone to damaging fluctuations. In this vital area, electricity, telecommunication, TV, radio and other industries, the Emiratis have turned to European companies and expatriates, mainly from countries like Germany, Sweden and Holland. UAE is a huge trading centre today. While almost all major countries trade there, Japanese and Chinese are competing strongly with the traditional trading nations. Any metropolis needs huge inputs in maintenance and cleaning services. We would see large numbers from non-oil producing Arab countries like Egypt, Morocco and even Palestinians in these services, including garbage disposal and recycling. The hotels, resorts and domestic aids, where pleasant, clean and hospitable service is called for, the employment is mainly from the Philippines and Indonesia. In the construction, road building and other labour extensive activities, we see large numbers of workers from the Indian sub-continent, India, Pakistan, Bangladesh dominating. When I asked Mr. Gunasekera about the Sri Lankans, he said that our numbers are relatively small, but would be found primarily in the same areas as the other Indian Sub-continent workers and of course as housemaids. The assessment of the inherent skills of the various races by the Emiratis is not inconsistent with that of the world’s relative ranking in the respective industries, country wise. Now, our Electricity Board is 100% manned by Sri Lankans. We remember the utterly embarrassing power failures that the country suffered about a month back. Even today, while I was typing this article, power went off twice, for a minute or two each time. This is not the kind of service that countries aspiring to be a hub for the region, or even talk highly of converting to a metropolis status, should offer. The various verbose explanations for the persistent failures of the Electricity Board are typically obscure and self-serving. This essential service now seems to have become a lucrative turf to be guarded at any cost by those benefitting in various ways. While their Brahmin-like accounts will have to be accepted by the helpless public in this country, we can be sure that a country like the UAE will not put its electricity supply in the hands of such engineers. As the renowned historian Durant observed, a society is formed by the character of the individuals who constitute it. What we are today is the sum of all the ideas, skills and talents of those who constitute the society. At any given time, it is both perfect and imperfect.